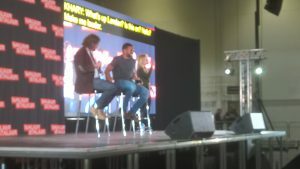 This weekend Walker Stalker Con London played host to the King and his second in command, Khary Payton and Cooper Andrews. The panel opened with Payton talking to the crowd while Andrews came later during the panel. The audience was packed out to hear from the two stars of The Walking Dead. The two day event offered fans of The Walking Dead and Game of Thrones a chance to meet the stars of their shows and get autographs, photoshoots and to talk with them. Check out the panel below. You can follow all of our Walker Stalker Con London coverage here.